Nickelodeon's "Yo Gabba Gabba!" has been ruling the cable channels under my nose. Who knew kids' TV could be so cool?! Gotta recognize! The picture shows the main characters of the show, but it's the guest stars and contributors that make this a stand-out show. Do you recognize the human in the picture? Yep, that's the Diabolical Biz Markie...the Human Orchestra! 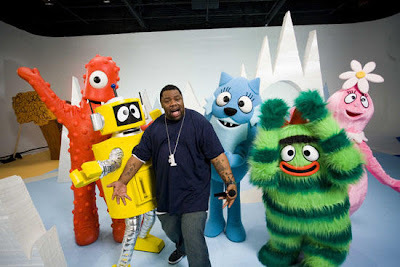 Biz has a regular slot on Yo Gabba Gabba! and even goes on tour with the show to do live human beatbox. Talk about keeping hip hop alive! Even The Roots, Money Mark and Erykah Badu have been invited on to the show. And now, courtesy of Cinefamily, us adults have a rare chance to meet the show's creators tonight in Los Angeles for a special celebration and discussion on how and why "Yo Gabba Gabba!" came to life! Get tixs here. Who said America was a cultural desert? !